Vermont sure has a lot going for it — a thriving local food movement, fresh air and mountains, great craft beer, and the best skiing and riding in the East. And if our elected leaders can get it together, we might just be the first state with universal health care. 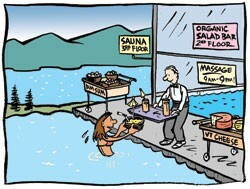 No wonder generations of homesteaders, hippies and health nuts have migrated north to the land of soymilk and honey. We love the scenery, scale and sense of community in this brave little state. Not to mention the syrup. But for all that, we know Vermont, and its largest city, could be better. We could have more. Ever come back from a trip — to Austin, San Francisco, Barcelona — thinking about something we don’t have? Something that would make our home better? Maybe it’s a pro sports team. 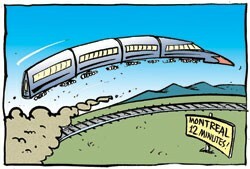 Or commuter trains. 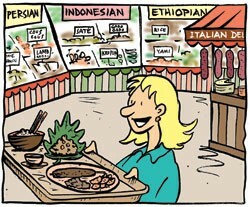 Or more ethnic food. We asked the Seven Days staff — and our friends on Facebook and Twitter — to come up with a holiday wish list for Vermont and/or greater Burlington. The results are a mix of whimsical and practical. If fulfilled, these stocking stuffers could make our Green Mountain haven even more of a draw ... but how to bring the Atlantic Ocean to Vermont’s eastern shore? All illustrations by Tim Newcomb. Burlington is not short on nightlife. Just about every niche is filled: clubby, classy, frathouse-y. But the endearingly awkward geeks among us remain underserved. For some of us, the sports bars are too aggressive, the dance floors too terrifying to comprehend. We’re just looking for a relatively quiet night of good-natured competition and tasty brews. This is why Burlington needs a downtown arcade-bar combo. 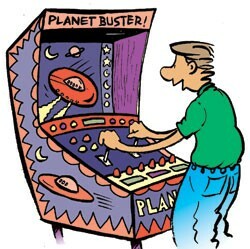 Currently, local gaming options are mostly limited to Pizza Putt, Zachary’s or the occasional Big Buck Hunter machine. These options are fun, but let’s be honest — the hyperkinetic, casino-gone-Candy-Land atmospheres and stuffed-animal prizes make clear that the target audience is families. And no one wants to be the solo young adult male creeping around. Plus, these places are not pedestrian-accessible from downtown. What Burlington needs is a place where grown-ups who know the Konami Code by heart can play the golden-age arcade classics. Hip spots like Barcade in Brooklyn, Ground Kontrol in Portland, Ore., and even the national chain Dave & Buster’s have proven the model in larger cities swarming with young, childless adults. What would you find at this drinks-and-Dig-Dug emporium? All the classic favorites would be represented: Pac-Man, Street Fighter, Space Invaders and this author’s personal favorite, NBA Jam (Boomshakalaka!). You’d also find more tactile games such as pinball machines, Skee-Ball lanes and bubble-hockey tables. Add in a few tap lines serving local craft beers and you’ve got geek nirvana. Haters might complain about hipsters being nostalgic for a time before they were born, but we’d be too busy trying to get the high score on Paperboy to care. Six years ago, I fell hard for Knut, the plucky polar bear cub born in captivity at Germany’s Berlin Zoological Garden. Then, last month, when the New York Aquarium took in Mitik, a 235-pound orphaned baby walrus with bulging eyes and a perky mustache, I was instantly smitten with the weird little guy. Wouldn’t it be awesome if we had our own zoo — and our own celebrity baby animals — right here in Vermont? I’m not talking about a petting zoo; we have plenty of those. Shelburne Farms has squee-inducing lambs and other barnyard fuzzies. Santa’s Land in Putney has miniature ponies, potbellied pigs and Bill the camel. And, if you’re into local lake creatures, there’s always ECHO Lake Aquarium and Science Center in Burlington. But let’s face it: Fish get old, fast. Where are our Bengal tigers? Our musk oxen? The closest exotic-animal zoo is in Granby, Québec, nearly two hours from Burlington. Sure, keeping wild animals is expensive. The Toronto Zoo spends almost $1 million a year to feed its 13,000 vertebrate animals. But zoos have succeeded in towns smaller than Burlington. Minot, N.D., only has 40,000-some people, but its Roosevelt Park Zoo houses tigers, lions, warthogs, giraffes, gibbons — even a Chilean rose-hair tarantula! Closer to home, the Squam Lakes Natural Science Center in tiny Holderness, N.H., keeps animals native to the area. So no poison dart frogs. But they do have mountain lions, bobcats and black bears. We could at least do that, right? I’m wishing for a small but spunky Vermont zoo, filled with unusual creatures and compassionate caretakers. To cut down on costs, I’d settle for animals comfortable in our cool climate. 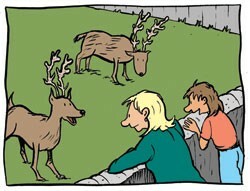 But I’d like at least one baby reindeer with a tragic past and star potential. I’ve long had a soft spot for travel by train. It’s without a doubt the most civilized way to travel — no airport pat-downs, no freeway gridlock. But Vermont is not exactly a major rail hub. So topping my holiday wish list is high-speed (or even moderate-speed) rail access. The first destination on my fantasy itinerary? Montréal, bien sûr! Rattling north to our cosmopolitan neighbor by rail isn’t such a far-fetched dream: Amtrak used to run a train from D.C. to Montréal, appropriately named the Montréaler. It discontinued the Canadian leg of that trip in 1995 to save money, and today the renamed Vermonter terminates in Essex Junction. But there’s good news for rail aficionados. Dan Delabruere, rail program director at the Vermont Agency of Transportation, says improvements are on the way. This summer, VTrans finished $4 million worth of track improvements that will allow Amtrak to reach higher speeds along portions of the Vermonter line. Next summer, VTrans will start replacing older tracks with continuously welded rails between St. Albans and the Canadian border — a prerequisite for passenger travel. Delabruere says the state is also working with New York and Québec to investigate the feasibility of a customs facility in the Montréal station to cut down on border-crossing time, should the rail service be reinstated. The goal is to connect Vermont and Montréal by train within three years. It’s sometimes hard for Vermonters to see the potential in rail travel. Our state is, after all, a vehicle-dominated one. But Amtrak ridership here is improving every year, and the state is marketing Vermont as a tourist destination to New York rail riders. “We see rail as the future,” Delabruere says. I think Burlington needs — no, deserves! — a really big, artful, frigging awesome monument. A landmark whose only purpose is to be amazing. Something that visitors would flock to, sending gushing texts and tweets back home, and that locals would be proud to call their own. My monument would put Burlington, even all of Vermont, on the world map. Like the Eiffel Tower in Paris. Statue of Liberty in New York City. Gateway Arch in St. Louis. Hello, Vermont? This Revolutionary-War-hero-on-a-horse stuff is so three centuries ago. It’s time to move on, and up. I can’t say what my monument would look like, exactly. I imagine the city issuing a request for proposals, which hundreds of talented artists would answer, eager for the chance to design something, well, monumental. But nothing phallic, please. My monument for Burlington would swoop and curve and have beauty and grace and move gently with the wind. It would be playful yet grand. Commanding yet welcoming. It would have an elevator that whisked visitors to the top for killer views and impressive vertigo. And did I mention it would be on the Burlington Waterfront? 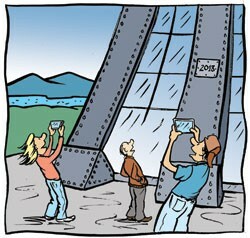 From my monument, watching the sun set over the Adirondacks would be even more breathtaking. There are so many worthy civic needs — affordable housing, decent health care, livable wages, etc. — and, sure, I’m in favor of those, too. But a monument, now that would give Burlington world class. To me, Burlington’s gaping culinary black hole is the absence of an Italian market — a place that harkens back to the city’s Little Italy section that was lost to urban renewal in the ’60s. In my vision, this market would anchor an entire food bazaar — a hodgepodge of kiosks, tiny markets and, eventually, eateries. Inside the Italian market, I would duck under dangling salami to knock back an espresso at the counter, then load up my basket with fresh, almost warm mozzarella, curls of guanciale, jars of marinated eggplant and fresh ravioli. At the adjacent bakery, I could grab semolina rolls, cannoli and flaky sfogliatelle. Nearby would be a fish market piled high with cases of fresh squid and clams; there’d be a stall where I could pick up fresh flowers, too. In the food bazaar, there’d be a place to grab slices of pizza so sloppy that you’d have to fold them in half to eat them; a raw bar for knocking back a dozen oysters; and a Korean barbecue where poker-faced servers would lay kalbi on your table grill. The pièce d’résistance: a comfy wine bar where you could sample new wines by the ounce, pairing them with tiny plates such as smoked herring and lamb meatballs. I thought this was only my dream until I spoke with Amir Jusufagic. He owns the Church Street food cart Amir’s Kebab, and for a long time he’s wished for a space where some of downtown’s food vendors could gather and set up shop for the winter. “It would be a little food court. We just need to find adequate space in Church Street; that’s my biggest problem,” says Jusufagic. Next to my grand and idealized vision, his seems more realistic. It starts with a dream, right? We’ve got mountains, rivers, forests and lakes — one of which is huge and totally awesome. 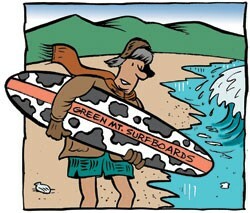 But Vermont’s missing something big: It’s the only New England state without an ocean. And that’s a total bummer. I’m not hating on Champlain, but our beaches and boatyards and lighthouses are just plain goofy without the waves of the Atlantic lapping at our shores. No clams or lobsters. No surfing or sea kayaking. No crusty old sailors in crusty old oceanside bars. No salty taste on the tongue when you dive into the drink. So here’s what I’m suggesting: a controlled demolition of the entirety of New Hampshire. This endeavor would necessitate the relocation of quite a few New Hampshirites, but surely Massachusetts and Maine could accommodate them. Also problematic: the Vacation State would no longer be attached to the rest of the country. The biggest hurdle would be how to deal with the Connecticut River. With New Hampshire out of the way, the towns lining Vermont’s eastern border — from Vernon to Norwich to Canaan — would be beachfront property, which is great. But we wouldn’t want to lose our greatest river, so we’d have to relocate that, too. The obvious solution would be to simply pick up the Connecticut River, drag it 15 or 20 miles to the west and drop it back down. Think my plan’s unrealistic? Fine. Let climate change keep working its wonders, and we won’t even have to demo the Granite State. If I lived in Austin, Texas, I could have spent Thanksgiving eating a full turkey dinner and drinking cold beer at the Alamo Drafthouse Ritz while giving thanks to the pop-culture gods at a Dumb and Dumber Quote-Along, or an R. Kelly’s “Trapped in the Closet” Sing-Along. That same week at the same joint, I could have watched Jacques Tati’s Playtime projected in 70-millimeter, 12 Monkeys, camp classic Road House, True Lies and something called Swinging Co-eds. Yes, life is good for a film fanatic in towns with an Alamo Drafthouse, the Austin-based chain that has announced plans to expand all the way to New York and Los Angeles. While its business model stands apart, many cities and college towns have some sort of brew-and-view cinema that alternates showings of first- or second-run movies with repertory and “cult” programming. Burlington? Not so much. The Essex Cinemas shows classic movies at its popular Throwback Thursdays, but its Club Take 2 lounge, which used to offer weekend brew-and-view options, has shut down indefinitely. Williston’s Majestic 10 hosts a bar, but you have to finish your drink before the show. Merrill Jarvis III, who owns the Majestic and Merrill’s Roxy Cinemas in downtown Burlington, says he likes the Alamo Drafthouse format and thinks “something like that would work at the Roxy.” The problem: “It would have to be an over-21 movie theater, always,” he says. Local liquor laws treat a theater where alcohol is consumed “more like a bar serving films,” Jarvis explains. Having an over-21 area would require a separate entrance. Brew-and-view theaters do exist outside greater Burlington: the Stowe Cinema 3Plex, the Big Picture Theater & Café in Waitsfield and the Savoy Theater in Montpelier all let you sip something stronger than soda in your seat. But a boozy Thanksgiving “Trapped in the Closet” Sing-Along? Not likely to happen unless you throw one in your living room. Vermont is a great place to be born. The state boasts the lowest rate of preterm births in the country, and among the lowest rates of infant mortality. Yet mothers here have one less choice about where and how to birth their babies than do women in many other parts of the country. That’s because Vermont — the hippie-dippy, earthy-crunchy, touchy-feely state we live in — has exactly zero freestanding birth centers. For those who aren’t versed in the nuances of birthing choices, birth centers are licensed clinics where midwives care for expectant mothers. They’re somewhere on the spectrum between home births and hospital births, with a focus on long prenatal appointments and a homey, holistic birth environment. Putney midwife Mary Lawlor worked for 12 years to try to make birth centers a possibility in Vermont but ran into countless roadblocks along the way. In the end, she decided to open a birth center five years ago in neighboring New Hampshire, and now parents-to-be travel up to 100 miles to give birth at the clinic. The good news is that a new group of midwives and patients is gearing up to investigate the feasibility of building a birth center in Vermont. Lawlor says that because surgeons attend 90 percent of births in the U.S., the assumption is often that more medical intervention equals better medical outcomes for mothers and babies. “The natural process, and the safety that’s built in and inherent in the birth process, gets completely screwed up,” says Lawlor. The result? One in three American women gives birth by Caesarean section. 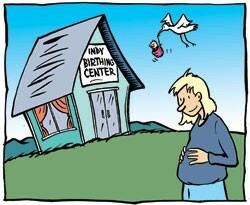 Lawlor sees birth centers as an antidote to that problem. If you still need some convincing, consider this: Birth centers shave serious dough off the costly process of birthing a baby. The American Association of Birth Centers estimates that if just 10 percent of the four million women who give birth in the U.S. each year chose birth centers, the savings in facility fees alone could total $2.6 billion. Burlington is renowned for awesome sunsets, but not a single restaurant in the city serves a lofty, unobstructed, all-season view of them. Only one eatery, the new Leunig’s lounge, appears headed in the right direction — up. But it’s only one floor above Church Street. Countless Queen City law firms look out over the city — no doubt to give clients a winning impression. Is it too much to ask for that law-office view with drinks and dinner? 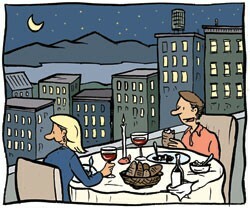 I want elevators, plate-glass windows, twinkling lights and traffic patterns without having to go to Boston for them. There have been a few failed attempts over the years. Old-timers recall a rooftop restaurant at the Hotel Vermont. Almost 30 years ago, a restaurant called Lilly’s moved from the ground floor of College Street, next to Marilyn’s, to the top floor of 7 Burlington Square. “Lilly’s Top of the Town” didn’t last long — it was structured as a private club — but the “views up there were killer,” recalls Yves Bradley, a broker for Pomerleau Real Estate. To justify the rent and infrastructure costs, Bradley says, it would have to be a high-end, destination restaurant — with outdoor seating — in a city that restricts signage. What? I, for one, would pay top dollar to nosh above a nocturnal view of Pine Street, Burlington’s only urban corridor that stretches out from downtown like a grand urban boulevard. It’s not the Champs Elysées, but viewed from the right altitude, it does glitter … a bit. On November 6, Burlington voters gave a resounding bongs-up to a ballot question endorsing marijuana legalization — with more than 70 percent of voters supporting the nonbinding “reeferendum.” In Sen. Bill Doyle’s unscientific Town Meeting Day survey last March, 49 percent of Vermonters supported legalizing possession of 2 ounces or less of marijuana. In light of such support — as well as the recent votes in Colorado and Washington State to legalize, tax and regulate the kind stuff — it seems inevitable that the green tide of prohibition repeal will eventually wash ashore in Vermont. To that end, it’s high time Burlington embraces its inner stoner and reaps the many rewards of a full-service cannabis club. 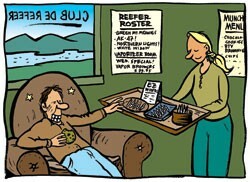 Green Mountain Green™ would cater to Vermont’s choosy cannabis connoisseurs. Its extensive, large-print menus of indica and sativa strains would explain each one’s properties, including taste, sensation and duration of high. An experienced “pot steward” would be on hand to recommend which nugs pair best with, say, carving turns in fresh powder versus kicking back with a 3-D Pixar movie. GMG would also maintain a full-service, late-night kitchen with plenty of baked goods — both laced and THC-free — and stoner-approved munchies, such as cold pizza, peanut-butter-and-chocolate waffles, and cheesy fries on cupcakes. Requisite décor and ambience demands only mellow, indirect lighting and couches and recliners cushy enough to embrace the body but not so squishy that they require grappling hooks to escape. A waterfront locale, with ample skylights, is preferable. Each year, the club would demo the winners of the Bern Gallery’s annual Pipe Classic glassblowing competition. And all customers would go home with the best doggie bags around. Sure, we’ve got farm-to-table restaurants, spectacular mountain views and an embarrassment of craft beers. But you know what Vermonters could really use? A swim-up bar. We’re a hardy bunch. We work tirelessly, endure brutal winters, survive for long stretches without sunlight or decent tomatoes. Is it too much to ask for the opportunity, right here in Burlington, to dog-paddle up to a submerged stool and order a mai tai? Here’s my vision: Transform the decrepit Moran Plant on the Burlington waterfront into SpaTastic Burlington, a multilevel, budget-friendly palace of relaxation. Inside, you’d find seven different saunas — from salt lined to gold plated, extra hot to icy — a miniature mani/pedi salon and an affordable massage studio. If you were there to get healthy, you’d graze the organic salad bar and dim-sum station. If not, you’d grab a corndog at the fried-foods café and plant yourself in the veg-out room: wall-to-wall La-Z-Boys, each with its own HD TV. On the lower level you’d find an indoor-outdoor heated pool — connected through the wall with a doggie-door-style flap. Outside, the infinity pool drops off into Lake Champlain. And inside, the pièce de résistance: a Caribbean-style swim-up bar. We’re talking outrageous, colorful drinks served in coconut shells and adorned with tiny umbrellas — locally crafted, of course. We asked our friends on Facebook and Twitter to suggest one thing that would make Vermont better. Here’s a sampling of their answers, roughly in order of how many times they occurred. Turns out Seven Days readers are a bit more practical than our staff.